Birmingham, AL – The Texas Southern men’s track and field team earned seven medals at the SWAC 2013 Indoor Track and Field Championships. The Flying Tigers captured one gold, four silver and two bronze medals. 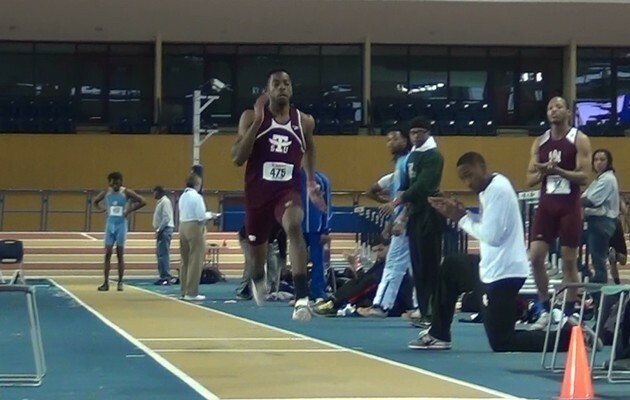 Aaron Rodgers, a senior from Pearland, Texas, was crowned SWAC Indoor Long Jump champion with a distance of 7.12 meters. Rodgers also took a silver medal in the high jump (1.98m). The Tigers had three other silver place finishers. Drayton Rolle (sophomore, Houston) was second in the long jump (7.09m), Arte’ Collins (senior, Missouri City, Texas) was runner-up in the 400 meter dash with a time of 47.65 and the TSU 4×400 meter relay team was second with a time of 3:14.47. The relay team members are Jeff Lacroix (junior, Miami, Florida), Collins, and Michael Holmes (junior, Houston). Texas Southern had two third place medalists. Demetrious Williams (sophomore, Boston, Massachusetts) picked up a bronze medal in the triple jump with a distance of 14.27 meters and Antonio Flores was third in the Pole Vault (3.75m). The Tigers earned 80 points and a third place overall finish in the SWAC Indoor Championships.